A straightforward guideline on what to do when you want to take your Professional Scrum Master 1 (PSM1) certification. 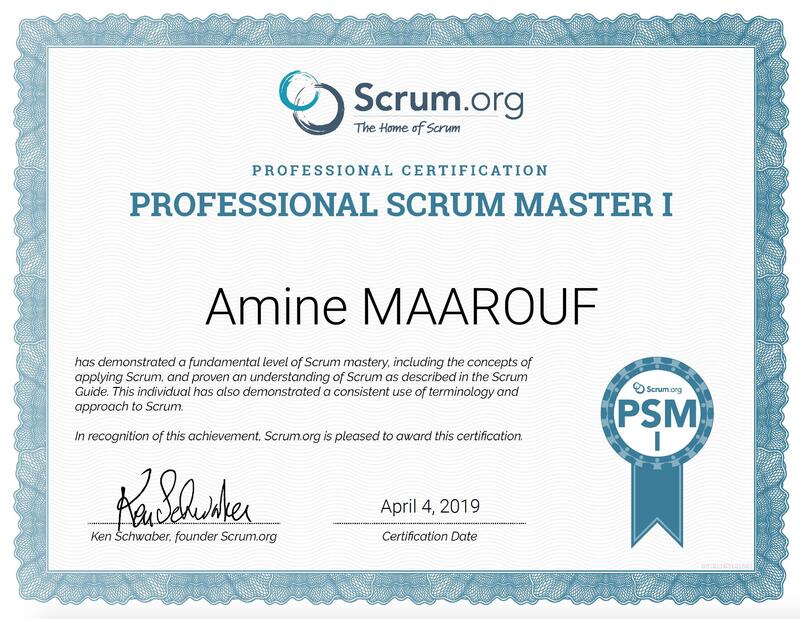 So, Finally, I am a Professional Scrum Master (PSM I). My attempt on the Professional Scrum Master Certification conducted by Scrum.org was kind of overdue, since I have been using Agile (and Scrum) in my projects in various capacities for three years now. And to be honest, the simplicity of the framework and the empirical process behind the Scrum has motivated me to pursue the subject further. 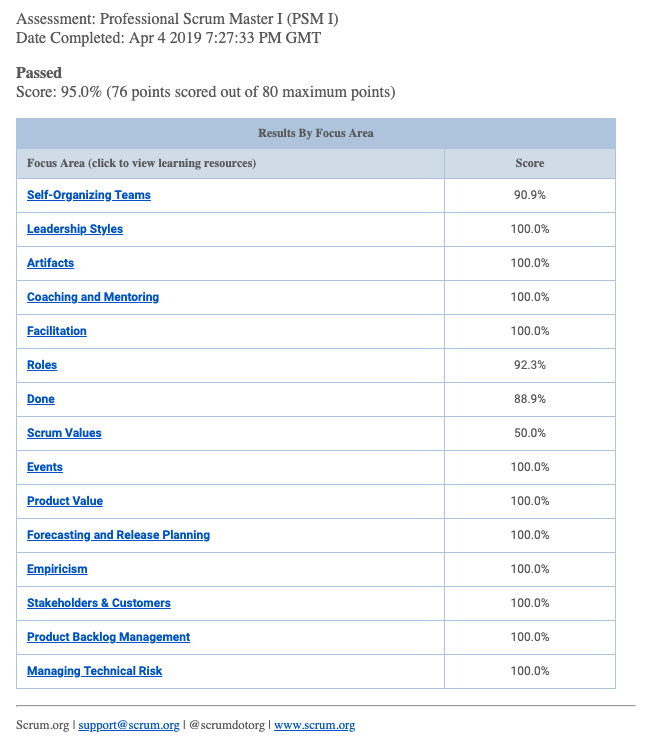 I did excellent and made sure to pass the exam with an excellent score by having 86 answers correct i.e. 95 % as score. After the exam, you do not get report of the question which you did not answer correct but you do get a consolidated report on the areas with your scores. Mine looked something like this. This at least helps me to focus on specific areas for Scrum, and gives me an idea on which ones i need to improve. Let’s be honest, there is no ready-made formula for success in any field and same applies here while you try to attempt get the certificate for Professional Scrum Master. And in fact, the certificate value equates to nothing if you have not learned anything during the process. Having at least one year experience as a scrum master, this helps you a lot to understand and practice the framework day to day Scrum Mater life. Scrum Training Series is a good way to be familiar with Scrum Artifacts, events, roles and the interaction between them. Reading the Scrum Guide over and over until I thought I know it all (Make sure that you're reading the latest version), The guide is very concise, and covers the essence of Scrum. I would suggest you to go through the Scrum Open Assessments (both and Scrum Master and Scrum Developer) multiple times before you are scoring 95% or more consecutive time. The open assessment has a set of approximate 40 questions. Out of which 30 questions are presented in an assessment.The assessment will give you an idea of questions which would be asked in the actual assessment. Additionally, you would find some of the questions from open assessment repeated in the actual assessment. This gives you surplus time and confidence during the examination.Personally, I found 10-15 questions being repeated in the actual exam. Don’t look around on internet for dumps of questions. You are not going to find any. And even if you do, then what’s the point of giving exam and get credentials? You could better create a Photoshop version of certificate to boss around. https://mlapshin.com a website that gives you bunch of Scrum ressources (Scrum Quizzes, Blog : FAQ and most asked questions). PSM I Simulated Exams from Management Plaza is a good tool to evaluate your preparation and readiness for the PSM I Exam. The simulator not only contains a set of 616,693 varieties of questions but also explains each and every answer. Go through the discussions on Scrum Forum. You would find a lot of people discussing their experience and queries on this forum. Group of folks here are willing to help you if have questions. A great place to hang around for Scrum enthusiasts. During the exam, don’t try to Google around for the answers. First, you won’t find any. Second, there is no guarantee that the answer is right. Third, you would be wasting your time. Keep in mind that you need to complete 80 questions in 60 minutes. That gives you 45 seconds per question. Yes, you need to be fast ! And yes, make sure you have an isolated place where you can concentrate while giving the examination. As the examination is online, you need to have a good and consistent internet connection in place. Have a glass (or two) of water with you. You would feel thirsty during the exam. Good luck to those of you who are preparing and attempting for PSM 1! Scrum Master at xHub. Agile addict. Copyright © xLogs, 2019 | All rights reserved.